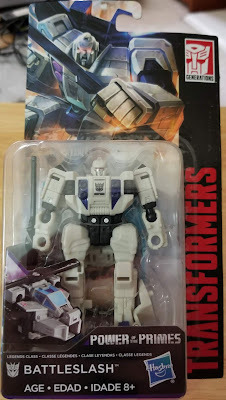 Battleslash, like his partner, is the other part of Battletrap in Power of the Primes. Giving the helicopter portion of the Duocon a life of his own and serving as a stand alone toy as well. Oddly enough for a toy that turns into a helicopter, Battleslash is very stocky looking. Wide chest, big thighs, aside from the propeller on his forearm, you'd never know he turned into a helicopter. Probably owing to his colors and that helmet, Battleslash makes me think of Astrotrain. I'm sure I can't be the only one, but for now let's just assume I'm crazy and just said something ridiculous. 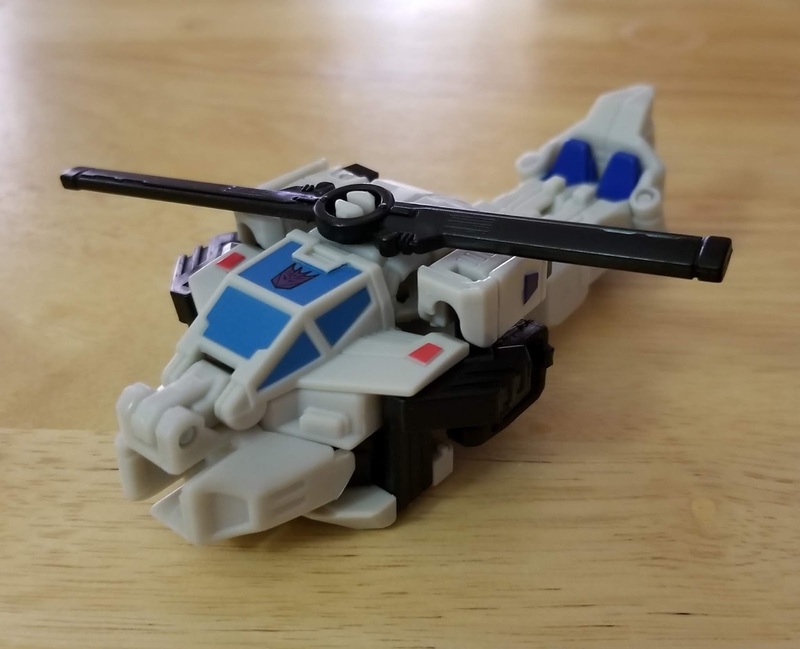 Of course with his wide stature, the only thing that really clues you into his alt mode is the propeller on his arm serving as some sort of melee weapon. That's a drawback in helicopter modes for me. Most of the time the blades are kinda just there in robot mode or combiner mode (more on that later this week). At least Battleslash has a weapon thanks to the propeller and it matches up with his name. You see he will slash you, presumably in battle. Or if you said something about his Momma, then he might cut you. I guess they could have called him Mommacutter. Like I said, he turns into a helicopter, and unlike his partner, it's a much easier transformation. I really like this mode, just a good helicopter that's not too unrealistic for a space robot that turns into a helicopter. 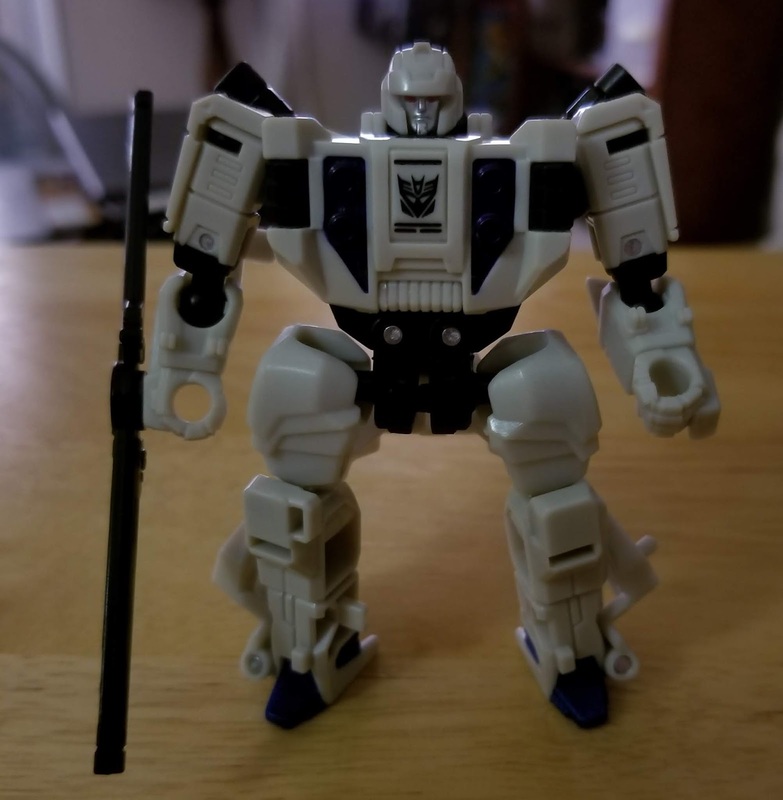 Fortunately his combiner mode doesn't impose too much into the toy aside from some visible hands and a hidden away head (and they're decently hidden). Though I'm sure there's a fair complaint for the connector outlet on the helicopters nosecone, it doesn't bother me regardless. Battleslash is a fairly neat toy that's fun on his own aside from the combination gimmick, and I really like the colors. I really wish I could find more words to say about him, but it's really as simple as that.